As Dragon searched for Earth following the destruction of Darkworld, his flying saucer was brought down over a strange planet dubbed Godworld. This infinity-shaped world served as a home to the offspring of the Elder Gods, their numbers having grown wildly out of control due to their immortality, causing their realms to become overcrowded. 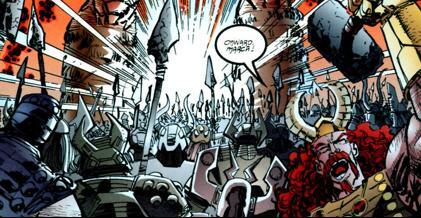 These Gods had been gathered into an army by Thor who wished to lead them on an invasion of Earth. Dragon and his allies were joined by Herakles in holding off the Gods until AllGod arrived and put an end to the insurrection. The Gods were restless and when the God Squad were captured on Earth, they eagerly accepted the job when Zeus dispatched them to recover their fallen comrades. With the majority of the Gods on Earth, a number of heroes went to Godworld to rescue some of their own abducted allies. The planet’s power source was destroyed causing it to explode, leaving the Gods homeless on Earth. Thor led them away in search of a new home, eventually selecting Atlantis. The underwater city was raised up to serve as their home for a few months before the Atlantean took it back with the aid of the Grokk. When CyberFace took control of the planet, the Gods were now being led by a recovered Herakles. He struck a deal with the dictator to leave them alone as their own vow of non-interference was still in place. The Gods created their Hidden City of God Town to live in which eventually became an airborne, floating metropolis. The invisible God Town was accidentally struck by an airplane which caused it to crash-land down to the ground. This awoke the Forever Serpent which required the Gods, the Special Operations Strikeforce and Dragon to defeat it. AllGod then rescinded the non-interference vow to enable the Gods to live free amongst mortals.